April | 2007 | Stay out of trees! The always enjoyable rest week continues, though I must admit my day at work yesterday was decidedly not enjoyable. Almost done, at least. I finally got motivated to get out for a townie last night on my singlespeeder and it was a beautiful night. I ran into a Bike Library volunteer who was also out riding. I ran into an old friend from the WOB days who was sweeping his sidewalks and what do you know, he and the missus had a baby! Max is his name, he joins older sis Natalie and cutest dog I’ve seen in a while Josie. Congrats. So I was Just Riding Along when I saw this crusty thing lying in the ditch, I had to stop and take it home with me, free is free. After the ride I went to the grocery store to get foods for us and then came home and who should be sitting on the couch but Jim Cochran, just back from Georgia! I dropped the food with Cody and rode Jim home so we could catch up. He had been at the Tour of Georgia and had some good stories to share. When I got home Cody had baked potatos ready so I ate one. Thanks Cody! Inspired by the potato mayhap or just tired of my shaggy mop of hair, I shaved my head. I used to be a long hair but now I find that the shaved head life is the best, I recommend it if you have never tried it. Ira is flying into Iowa today, hooray! I got into Chequamegon, hooray! The year of the knobby bike will continue, hooray! It has been another busy weekend around these parts and quite a few things occured that would have been best conveyed to the worldwideweb with a photo but I did not have the family camera with me so poop on me. You will now have to read my long winded explanations. Today I had to prepare brunch for an undisclosed number of the overprivileged at Just Another Sorority so I did. It was a tremendous amount of muffins and cinnamon rolls and the like. Moms and dads and families drove into Iowa City from all over the midwest to celebrate Earth Day with their daughters. Maybe some flew in. I rode my bike in to cook for them. After brunch was made and eaten and cleaned up I went downtown and got me an iced coffee (the weather has been super this weekend!) and moseyed over to the Bike Library for some quality Rental Bench time with like minded folk. It was crazy busy for a while as everyone (figuratively) stopped in to ask questions and donate bikes and buy helmets and talk about Barack Obama and what not. B.O. was in Iowa City to celebrate Earth Day and presumably try and convince some of us sophisticated Iowa voters to pick him to be the democratic party’s presidential nominee. We’ll see. Yesterday was a perfect example of why I love rest weeks. No training means free time! I was up early and out the door with Cody to ride with her to her Saturday workshop. I left her to her influencing of impressionable youth and rode to the Bike Library to pick up the 8 foot Bikes At Work trailer. I am only equipped with single speed townie choices right now as my truck needs a spoke replaced in the rear wheel so I decided to take advantage of my enviable postion as a BL keyholder and steal a bike! There was a sweet $90.00 unit ready to go and I pulled that tag off right quick and hooked the trailer up to that beauty. It was a nice Fuji with a BL special upright conversion plus it had fenders and thumbshifters and a bottle cage even! Okay I suppose it is right and fair to let you know that I was not really stealing the bike, I was running official BL business. I took the overflowing trash can to our dumpster, which is far away for some reason. After a successful trash run I hightailed it back with the can and dropped it off so I could quick do another crime! Seedy business this car free living. I went to the New Pi Co-Op and boosted four pallets from their magic stack-o-nine-pallets. I may sound like an Enron executive at this point in my long winded tale and again I must come clean with you. I had permission from the grocery manager (photo unavailable) to take the pallets. I rode the pallets home for our compost expansion project and then rode back to the BL to drop off the trailer and get that awesome bike back so that it could be checked out by a needy citizen. I made it back at 10:00am just as the doors were opening and I stuck around for an hour or so to help with the crush of eager checker-outers. It was fun to be there, I have been missing out on retail hours because I have been busy. Finally got away, rode home, had lunch, went to the Broken Spoke to work the afternoon away. That wraps up the weekend that was, mostly, and I am sorry for the lack of pictures. I will get better, I promise! Okay, like a hidden track on a cd, here are a couple of pictures for you, loyal fan and reader! Thanks for sticking with me till the end. For real. What a whirlwind of a day. I forgot my work keys. It was a big day as I was making soup from scratch and my food rep was coming in to take the order for next week but what could I do. No keys means no storage room or refrigerator access. So I rode home to get the keys and then back to work. I was late. When I worked in a somewhat real restaurant the chef used to say “We’re in the weeds” which meant it was time to put on the “Go-boots” and work really hard for a while. So I did. Chaos was averted and the ungrateful women of Just Another Sorority were fed their tasty soup on time. Whew! This is the counters and stove/oven and slicer and cabinets and serving things and such. This is the other side of things, my “office” complete with really loud refrigerators that run just about all the time. Once I am rendered deaf I plan legal action! This is the storage room that you can just see a peek of in the last photo. Sorry its so blurry. Look at all that food! In the afternoons I generally can sneak away for an hour or so. I get coffee, go to the library, sit in the sun (seasonal), run errands, etc… Today I had some errands to run so here is what I did. Left work on my singlespeed knobby bike with an enormous but light trash bag of plastics to be recycled as well as a backpack full of grocery sacks fated for the same. Went first to the City of Iowa City HQ to pay our utility bill. Paid that sucker in full in no time flat. Rode home to pick up some home recycling and pet happy cats in the sun. Left home with more recycling on my person, rode to Hy-Vee North Dodge to do some business. Dropped the recycling in the appropriate bins outside, locked up the bike and in for some shopping. Shopping spree begins, I have to stock up on a few things for the Just Another Sorority brunch I have to do on Sunday. I get lots of stuff, don’t have to pay for any of it! Yeah! Leave Hy-Vee with nothing, they deliver! Back at work, what a productive hour and no car required! Stupid cars. After work I did the College Green ride. I was tired and knew it and my motivation was lacking but I figured I would go anyways as this is the last ride of my planned 3 week “build” and I wanted to get the most out of this one. Same route as Tuesday, maybe not quite as hard but we still busted the group down small (6) and I could feel myself getting more and more tired with every pathetic pull I took. We turned in and I kept playing the same game, pulling just enough to get really tired but hoping to finish the ride with the group because that would be the fastest ride in. I got dropped. Ah well, rode in slow and easy with David, who had also gotten dropped at some point and I am happy to be home and warm and ready for a rest week! Yeah rest week! Other news, I have been reading the Peanuts books that are being released of the strips in order from the beginning. They are great and the library just got a new one, into the 60’s we go! Check them out if you are inclined, Charles Schulz is amazing! I gotta say it was a good day. One of my favorite things to hear the Euro-Pros say after their early season races is that they were not able to contest the victory for this reason or that but that they had good sensations during the race. Cool! I understand what they mean and I must say that after a few discouraging weeks of riding I myself am starting to feel some good sensations out there. Training works. Ride, rest, repeat and low and behold, you get faster. I think I first felt the good sensations on last Thursdays ride when we raced the rain in and I felt more in the knobby race this past weekend when I was spinning that 34X17 for all it was worth down the wide open sections and not just holding folks off but passing them, too. Then on tonights ride, still feeling a bit tired and sore from that knobby race I rode hard and felt them good sensations again, even if I got dropped. The group was down to eight of us or so at that point and I got pinched in the wind (we were not playing nice tonight) and was off. I got caught by two and could not even see anyone else behind. Crazy. So we kept rolling out to Cedar Bluff and turned in. The group turned around in Cedar Bluff so they came at us fast and we got swept up in the tempest. It was crazy, people attacking, bridging, getting dropped. At one point I was all alone behind a group of three and I started yelling at them to wait up. They didn’t. Punks. So anyways, we even got wrapped up in the “b” ride and we dropped even more people and it all came together before the last sprint (amazing) and a truck was in the middle of things and the Adult and the Thrillaaah and Jim sprinted around that thing in the oncoming traffic lane into a blind corner! Crazy! We all survived, I rode myself silly and am happy to say that I felt good sensations even though it hurt a lot. This is my third “on” week so I will be taking some rest then before the Decorah tt, that will also provide me with some good sensations, I imagine. I have never tested positive. I want to put all of that behind me now and show that I can win 100% clean. The morphine found in my sock drawer was intended for my dog. The dentist gave me cocaine before a procedure. Oh, wait, I mean my grandma gave me some Colombian chocolate that must have had cocaine in it. I did what I had to do to win le Tour, if I die when I am 50 that is my problem. Last thing, here is a link to a slideshow of photos (with audio, too!) from the knobby race, none of me “in action” but one of me demonstrating “inaction” although the trained eye will see that I am actually doing product placement for this feller. Well, not really, but thanks for believing in me. I raced my old Bridgestone today in the Sport class at the Sylvan Island Stampede in the Mississipi river. It was cool. Okay, it was on an Island. There used to be an armory out there and there are lots of remnants of foundations and sidewalks and even brick streets. Super fun trails, “flow” was a word I heard a lot today. Also much mention of broken glass as there was lots. Everywhere. I hitched a ride over with Brian Eppen. I am very relaxed about this whole mountain biking experiment so I had done very little research into this event regarding details like start time. So Brian and I took our sweet time and rolled over to registration and they told me it was closed. I got nervous as there was a very good chance I would go bats and register for the Expert event if I could not get in the Sport. They let me in. Whew. Next problem, I am in street clothes, have not eaten or taken the all important pre race poop and I am a good half mile from the car. 20 minutes to the race – GO! I shot back to the car, changed, pumped up the tires to just over 40 which I seemed to remember worked well back in the day and I even remembered that I had changed gears that morning so I checked the rear wheel bolts and they were loose. Tightened them. Stuffed everything into my pockets that I had planned to put in my seat bag and blasted to the course with Brian’s helpful reassurance that underseat bags are not considered “pro” in mountain biking. I even had 4 minutes to ride the first eighth of the course! To the line then. Everyone was there in the start shoot and I did not want to step on toes as this is not my scene so I went to the back. The official said there were 80 of us and said GO. There was a long pea gravel bike path section to the singletrack and I spun my 34X17 smooth as I could and passed lots of people, kept the speed until the trail started, I think in 30th or so, nice start! I was a bit gassed but there was no way to move up so I just settled in and recovered while I learned the course. It was really fun with lots of landforms and such to ride over, rocks to dodge and stumps and what nots. When we hit wide sections I passed people. There were a couple that were really long and I hit them hard and I am suprised to say that throughout the race I never once got passed. 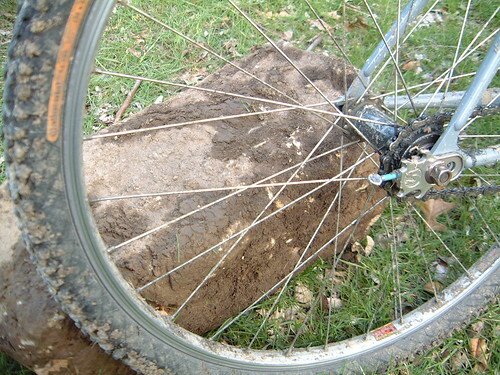 I had all the fun mountain bike race stuff happen like clipping rocks with pedals and sliding out in corners and one tangle with a kid who liked to get big air. Fun! I settled into my rythm and am very happy with the way the race went. I finished 11th which I think was very good, considering and I was happy to see that my last lap time was my fastest. I think I could have been up contesting the money spots (top 3) if I had planned better and taken a warmup and pushed up front for a better start position. So there you have it, I raced my singlespeeder. Lots of things going on these days. I am officially a board member of the Iowa Bicycle Coalition. I worked at the shop again today, it was hectic at times but I was happy to be there. Anybody needs some cat hair just let me know, we have some. Tomorrow I am going to race my mountain bike. It has been a long time. I don’t even ride my mountain bike much anymore and here I go racing it. Typical. I have been meaning to ride off road more, but for years now I have been out of the practice. I used to be much more “into” it. 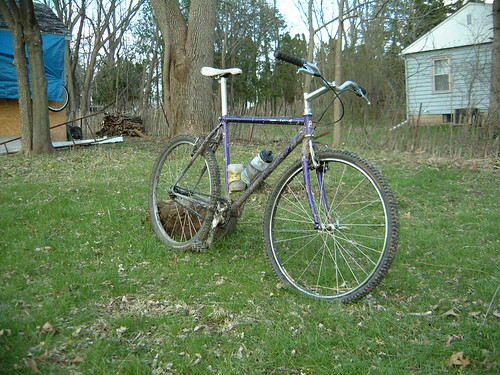 I had a really nice mountain bike by 1993 standards. Steel! Titanium pedal spindals! A (yellow) Kooka crank! 21 speeds to choose from! Yeah, it was purdy durned nice. I even took a trip with friends to Moab, Utah and went to the Cactus Cup in Arizona before they turned the course into a nice neighborhood for folks with a spare million or two. Thems were the days. He is Libor Karas and he could do amazing things with bicycles. Probably still can. Big lesson about trials is that it is not good for the equipment. So I started replacing all broken parts with bigger and or heavier ones. Handlebars, wheels, fork, derailleurs, seats, they all got busted. 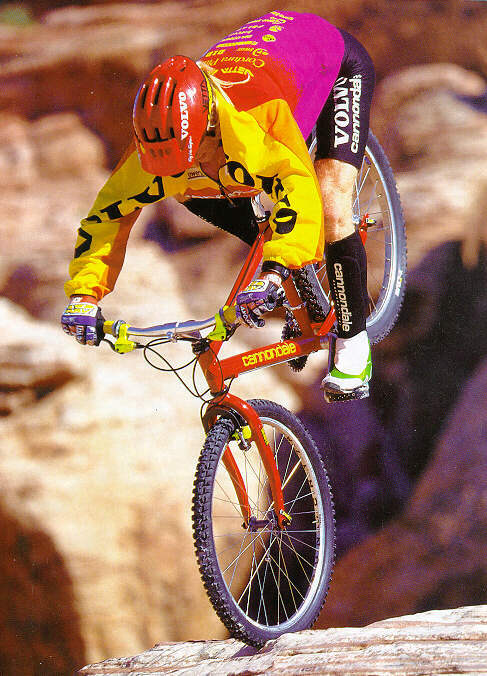 Before I knew it I was riding a 30 pound mountain bike when I would head to the trails. It sucked. I quit mountain biking altogether. Then, in 1999, I had just finished backpacking the Appalachian Trail and somehow or another found myself at Chequamegon hanging out and drinking beer. Someone told me they had run into someone out on the trail and thought they had blown up and were riding slow but no! He was riding a singlespeeder. I was intrigued. I talked to some folks, looked at their bikes and thought I would like to try that. So I went to the Iowa City Spoke and Ski (a fine Iowa City bike Shop, long since closed) and had them build me up a wheel and get me rolling. Once I got it all “dialed” it was so much fun I found myself whooping and hollering as I rode my (kind of) light bike. I did a night ride and had so much fun I had to call my friend Ralph and tell him all about how cool it was and how I had not smiled on a bike ride like that since that time we got arrested on RAGBRAI. He was sleepy but impressed! So now, years later, I have been riding my singlespeed with not much regularity and I have been missing it. Last summer the Helping Friendly Book, friendly and helpy as he is, told me we should ride trails and I said my bike needed this or that done to it and he was having none of it and told me its a single so not much can be wrong so lets go ride. We never did. But I was inspired to get that bike running again so I had a local reputable framebuilder throw some horizantal drops on there and I bought a few new parts and at least one old one and I am back on the trail! Here then, is the bike! Yeah, that’s real mud, not airbrushed crud like you see in those Vanilla ads. Okay maybe they dab the mud on with a paintbrush, doesn’t matter. That’s a genuine flat front tire, too. Boring and gratuitous component picture, but you can see THROUGH the bottom bracket! Isn’t that amazing? The Pièce de Résistance! Nuk-U-lar Proof carbon front hub! One of the many fine party gifts I received for working at the Broken Spoke last summer. How long will it last? Hopefully through tomorrows race at least. And Brian, if you are reading this, I am finally ready to ride with you! So its snowing, not enough to ski on and certainly not enough to merit digging the snowshoes out of the shed, but its snowing just the same. Did the group ride last night, we were shooting for an Edens loop but as we approached Hwy 22 it started to mist heavily and I decided to turn around and “make a run for it” with the strong tailwind. A few smart fellows turned around immeadiatly and with a simple shift of the front der our 14 mph became 30. Everyone else turned around but their hesitation cost them the chance at victory which was taken by the always tenacious Jim Cochran. It sure was fun to rotate at 30+ for 10 miles or whatever that stretch is, and we stayed out in front of the rain, too. Bonus. Cody has a “zine pal” coming to visit tonight so we will be hosting. He lives in LA and is coming out to Iowa to see his favorite band from his high school days play at a grungy bar. He must be cooler than me because my favorite band in high school was Def Leppard or some such excuse for music. We will find out tonight! In other news, I have been offered nomination to the Iowa Bicycle Coalition Bored of Directors, what should I do? I am on the advisory comittee now and moving to the board would actually give me some say in directing policy and such, but it has proven to be a hassle since I first started offering my help to them. I enjoy working with the Bike Library and organizing Bike to Work Week here in Iowa City and maybe I should just throw myself totally into them? I ask for guidance, E-Friends!